Getting .edu links from official university sites and .gov links from Government site seems to be one of the best ways to boost your site’s ranking up on search engines. 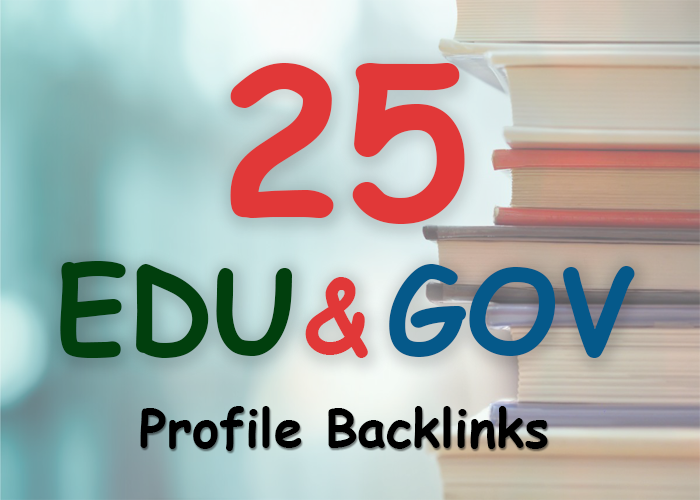 Why you buy Edu and Gov Backlinks? And despite the Panda, Penguin and all the other Google algorithm updates, .edu and .gov links are a reliable choice to increase your website’s trust, authority and at the same time it’s keyword rankings. 1. Domains have authority and trust inside the eyes of Google and also other search engines. 2. All links from High Domain Authority. Like DA 50 - DA 100. 3. 25 different Domain that`s means 100% Unique Domain with very low OBL. 4. All backlinks are create 100% Manually. It`s 100% safe to any kinds of website. 5. These backlinks are 100% friendly with Panda, Penguin & Hummingbird updates. Q. How many keyword you accept per order? A. We accept maximum 10 keywords per order. Q. Do you do any thing for indexing these Edu & Gov links? A. Yes, we ping all of the links. We turn all the links into RSS through linklicious and ping them for faster indexing. A. You will get complete Excel report after completion. You can check live click able edu links in report. Q. What all information you need from me? A. We need only Keyword, URL, Desription and Title from you. Q. Do you accept all Language website? A. Yes, We accept all languages website from the world. Manually build 25. edu and. gov safe seo friendly backlinks is ranked 5 out of 5. Based on 5 user reviews.